Create all the products you need. With SmartWeb, there are no limits on the number of products you can create. Add all your pictures to your products and view them with a zoom function or picture rotation. Create product descriptions, which sell your goods – insert pictures, videos and links to present your goods in the best possible way. You can create as many variants for your products as you need e.g. size and colour. Du bestemmer selv om dine produkter skal knyttes til én eller flere produktkategorier. It is easy to set your prices (and suggested retail price including cost prices on demand) on your products. Create discounts for selected customers and customer groups or when you sell more than one of the same product. You can always create more currencies and multiple delivery countries with individual VAT zones. Product reviews gives your customers the possibility to write a review or ranking with a number of stars. Keep control on stock amounts with automatic stock control on SmartWeb and automatically stop selling once a product is out of stock. View related products to your goods and sell more. Choose which products or let the web shop do it automatically. Create more sales on your web shop with by showing supplementary products for your goods. In SmartWeb, you have the possibility to combine products that belong together or when you want to make a good offer. You can decide for yourself if your products should have more than one product category. Create your products in many languages to sell in overseas markets with the additional module “Language”. With the module “Product Filter”, you can make facetted searching in your product list, when customers should between multiple products. Read more about Product List. 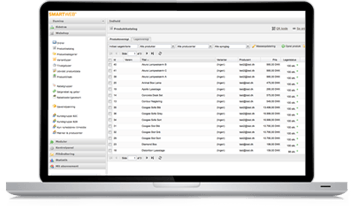 You can import or export all your products in CSV or XML format, when you have use for it.